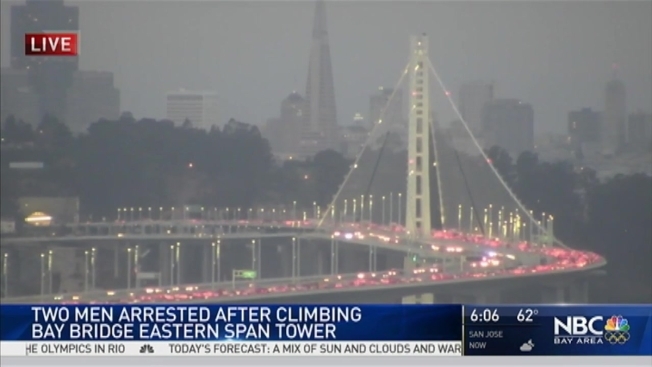 Two men were arrested Sunday after climbing the tower on the new eastern span of the Bay Bridge, according to the California Highway Patrol. The CHP said the pair, ages 18 and 23, were arrested on suspicion of trespassing after they walked up the bike-pedestrian path on the southern side of the new span, jumped a railing and then climbed a large suspension cable to reach the top of the 525-foot tower. The men, who were not identified, were on their way back down by the time officers arrived, the CHP said. The men were booked into San Francisco county jail.